Brian Boru was born in the 9th century. His early life was dedicated to supporting his brother Mahon, king of Munster, in the struggle with the Norsemen, who tried to impose taxes on their lands. Brian became king in 975 when the Vikings murdered his brother. Inheriting the kingdom, he launched a series of wars with the Irish kingdoms, with the ultimate goal of unifying Ireland, a dream that was made true in 1003 when he was crowned Ard Ri na hEireann. Base and scenery not provided, Model comes seated on cast on rocks. 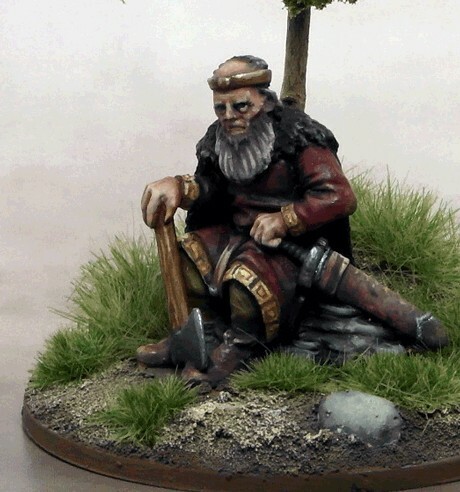 28mm sizewd metal model, supplied unpainted.